Munsiyari’s name refers to a ‘Place With Snow’. Situated on the banks of Goriganga river, it is a fast growing tourist destination, and mountaineers, glacier enthusiasts, high altitude trekkers and nature lovers commonly use it as their hub or base camp. 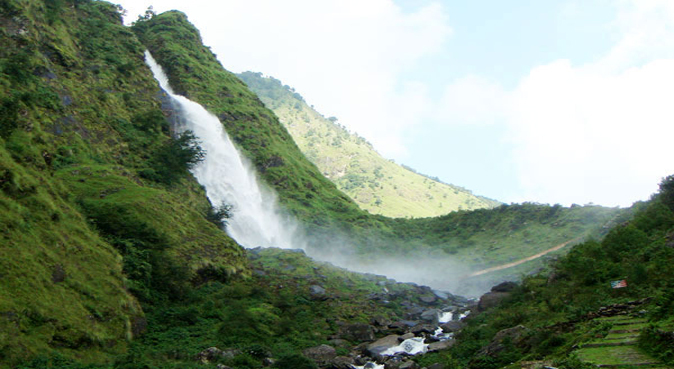 Munsiyari also falls on the ancient salt route from Tibet and is at the entrance of the Johar Valley, which extends along the path of the Goriganga River to its source at the Milam Glacier. It is inhabited mainly by the Shauka people. The town is surrounded by snow capped peaks, with a key attraction being the trekking route to Khalia Top. Khaliya Top Munsiyari Khaliya Top : High altitude gentle slope meadows located at a distance of 7 kms, from Munsiyari. Ideal site for skiing and adventure sports. Betuli Dhar Munsiyari Betuli Dhar is about 5 kms, from Munsiyari. Madkot Munsiyari Madkot 22 kms, from Munsiyari. Madkot has hot water springs which cures rheumatism, arthritic pains, skin eruptions etc. Birthi Fall Munsiyari Birthi Fall 19 kms, from Tejam on the Munsiyari motor road. Birthi Falls are quite spectacular for its waterfalls. Wayside amenities and fast food centre is available. Kalamuni Pass Munsiyari Kalamuni Pass is situated near Munsiyari in Pithoragarh District. This region is surrounded by oak and birch forests. It provides an enchanting view of Panchchuli Peaks. Kalamuni Temple and Kali Temple are located here. Other nearby tourist destinations include Kalamuni Top, Thamari Kund, Birthi Falls, Maheshwari Kund, Khalia Top, Betulidhar, Milam Glacier, Namik Glacier and Ralam Glacier.